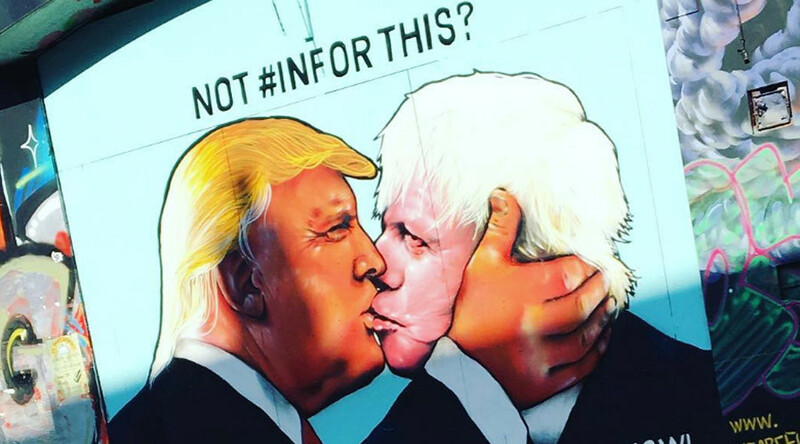 Brexiteer-in-chief Boris Johnson and presumptive Republican presidential nominee Donald Trump have been immortalized in a mural created in Bristol depicting the eccentric duo locked in a passionate kiss. Beauty, they say, is in the eye of the beholder. While few would argue Bristol’s latest public artwork is beautiful, it is certainly eye catching. The giant mural of the US presidential hopeful and the former London mayor is called ‘The kiss of death’ and is aimed at encouraging young Brits to register to vote. The painting is a homage to the 1990 Berlin Wall mural by Dmitri Vrubel, itself based on a photo from 1979 showing Soviet premier Leonid Brezhnev and East German chancellor Erich Honecker in a fraternal embrace. We Are Europe co-founder Bethan Harris said the mural was created to encourage people in both the UK and US to take part in this year’s democratic outings. “We started We Are Europe because we didn’t want anyone to wake up on June 24 and wish they’d done more to ensure we didn’t sleep walk into Brexit. The polls are tight. Not turning out on either side of the Atlantic, is a vote out; and a vote for a world with these two guys in charge,” she said.